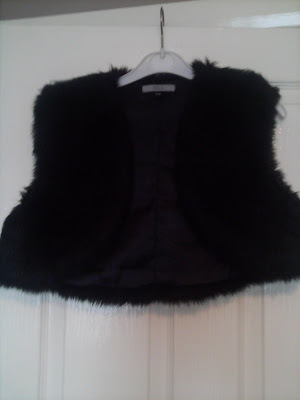 Well my 2nd M&S faux fur bolero arrived today from ebay, I only won it Thursday night, so really good service received-it was only £1.20 plus £1.99 postage, a really good bargain!! I'm pleased with it as it will be a great evening wear item with LBDs, my other 3 faux fur gilets are more daytime wear. So, the grand total of faux fur gilets is 4-one in winter white, one in brown, one in black and the other is the faux shearling and embroidered one. I think I'm all done for gilets. Now, what next for the wardrobe?? What a beautiful little jacket! I love faux fur for winter. I think it's so much more stylish and cool than some boring padded anorak (which, alas, is what I'm stuck with most of the time since it's too rainy for anything else around here). I think it will look smashing with evening wear too! I love it! You are all set now for any occassion. I've never been on e-bay or purchased anything on line. Maybe I'm missing out on something! What's next? Faux fur boots? I'm loving the boleros, so easy to dress up or down, well done on a fab bargain! Quite a collection and I was only writing today for some magazine how handy bolero's are for maxi dresses as party wear this season - you are sorted! I'm thinking with 4 boleros already, why not 3 more - one for each day of the week??? HOpe none of these goes Grrrrrrrrrrrr! That is the perfect LBD bolero. Good find! Great you have that many. I'd like a long cardigan. I love waistcoats. I don't often think to wear them though, which is weird. You look great in your one below.